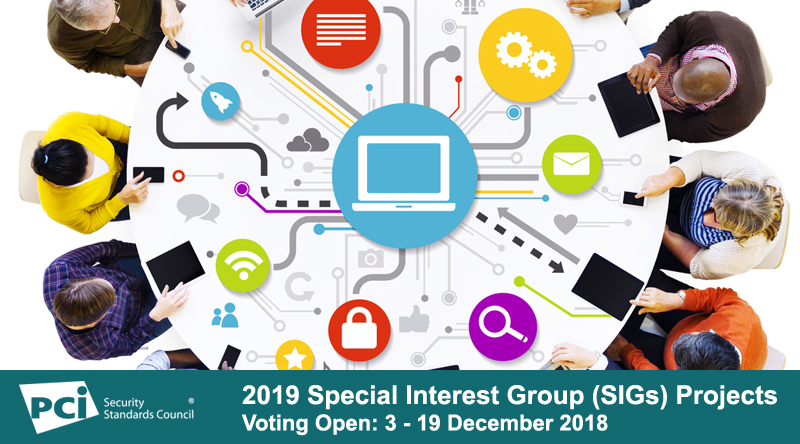 From 3 – 19 December PCI SSC Participating Organizations are invited to vote on proposals for 2019 Special Interest Group (SIG) projects. Special Interest Groups (SIGs) are community-driven initiatives that focus on payment security challenges related to PCI Security Standards. SIGs bring together experts from across industries and around the world to address the topics that are most important to their payment security efforts, resulting in practical and relevant resources that help stakeholders apply PCI Standards to their organizations. To vote, Participating Organization business contacts must log in to the PCI SSC portal to review the choices and select up to three projects. Please note that the business contact will be the only person with the ability to access the ballot and will submit a vote on behalf of the entire company. 2019 SIG projects will be announced in January 2019. PCI SSC will work with those that are selected to create charters prior to the commencement of the new SIGs in early 2019. Thank you for your participation. This kind of direct involvement by stakeholders is invaluable to our efforts to provide resources that help security payment data.